What made me a fan of The Selection was the fact that it was a book that I wasn't to take too seriously. It didn't set out to be the next ground-breaking literary work, but it promised an entertaining read, and that it delivered. At least half of it focused on a contest similar to The Bachelor, with thirty-five ladies competing for a prince's heart, and being the reality show maven that I am, I immediately selected my favorite girls, and fervently wishing that those I dislike to be sent packing. America, while not exactly a heroine I immediately connected to, made for a rather enjoyable MC, and while I did roll my eyes at her thoughts and antics sometimes, I still rooted for her to find her own happy ending. So really, can you blame me for expecting The Elite to be along these lines? So yes, let me spit it out - The Elite isn't what I would consider a breezy read. As a matter of fact, I actually had to put it down a few times because it was starting to get a little too emotional while reading it. There were times wherein I found myself wanting to chuck my copy at the nearest wall because I was thoroughly exasperated with America's indecisiveness, yet at the same time, there were also many instances wherein my heart ached for America and I just wished that I could give her my shoulder to cry on. She's not an easy character to read about, and I honestly can't blame people if they find America's constant flip-flopping between Maxon and Aspen grating, but what stood out to me was America's desire to be loved for who she is, and that just tugged at my heartstrings. I wouldn't exactly say that America's character developed by leaps and bounds in this novel, but she did take some necessary steps into discovering just who she is as a person, and that's enough to make me continue to believe in her. 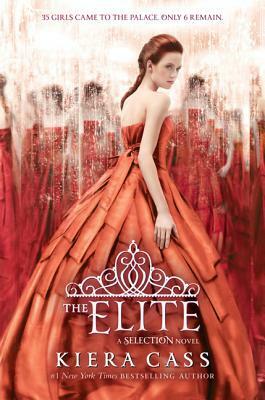 I was originally a huge Maxon fan, but after reading The Elite, I realized that there is so little that I know about his character. In fact, I would even go as far to say that I ended up disliking him severely in several parts of the book. I had a difficult time gauging his honesty and sincerity, and there were moments wherein his decisions left me both confused and disappointed. In The Selection, I loved how apparent it was that Maxon had America's best interests in heart, but I couldn't see that in this book. He kept on pushing her to choose between him and Aspen (though he still has no idea that Aspen was the other guy in the picture), and when he couldn't force America to make a decision, he immediately sought out the company of the other girls who make up The Elite. In contrary, we have Aspen who's been nothing but patient and respectful, and can't help but compare both guys. I know, I know, America isn't exactly a saint either, given that her affection switches rapidly between Maxon and Aspen, but America's confusion always proved to be genuine to be me. She honestly had no idea who would be the better fit for her. Maxon, meanwhile, never seemed like he truly cared about the other girls - he simply needed a distraction from the emotional whirlwind that is America, and that's why he started spending more time with them. Also, he clearly liked messing around, and I hated reading about that. Although I have to say that I did like how Maxon dealt with the Marlee situation, so that gets him points in my book. It was an emotionally exhausting task to read this book, and even writing this review is emotionally draining. I hated up hating most characters at one point or another; I wanted to stab myself every single time America skirts around finally making a decision; my throat actually clogged up whenever I felt America's frustration at Maxon's complete 180, but you know what? I still had a grand time reading this novel, and I enjoyed every bit of it. The drama was enough to keep me hooked, but I also loved how Cass revealed some important details about both the origin of Illea and the royal family. Best of all, I loved reading about America's journey (but what a long, treacherous road it was, and it's not even remotely close to being over) of self-discovery. I'm not a big fan of the first book because yes, it really is emotionally exhausting. I don't know if I want to pick up The Elite someday, but it definitely is a book i'd go for if I wanted some drama. I wasn't sure that this is a series I would like but I have been reading quite a few reviews that are making me think I may want to pick the first book up. I'm guilty of not reading the first book and instead watching the spoilery barbie video made by Epic Reads, but I didn't expect this series to be too serious. I'm glad that you felt emotional reading this book, it makes me want to pick it up soon. Lovely review, Lyra! And can I say that I feel like Maxon is really dumb if he didn't know that Aspen was the other guy. Just a thought. Huh, you've made me want to give this series a try. I love that you became so emotionally involved, despite your frustrations. Great review! I haven't read the first book but seeing how much you loved this one definitely makes me want to give it a try. I admit that they always catch my eye at the bookstore because they are just gorgeous but the premise has just never grabbed me. Fabulous review! Thanks for the review, Lyra. I'm currently reading the first book. I'm really enjoying it. Can't wait to get to the second book!